Chef Tom Diamond serves soft-shell crabs, beans, rice and andouille sausage at the Mardi Gras preview. King Oyster stands in full regalia - seashelled staff, foil crown and faux-velvet red cape - alongside a short, pointy-hatted mime wearing an expressionless white mask and a robe draped in strips of green, purple and gold fabric. They look on silently with everybody else as Anne Arundel County executive Janet Owens slices into a king cake. She is careful not to halve the hidden plastic baby. Mardi Gras has begun in Annapolis. Though not the two-month festival season begun January 6 (12th Night) in New Orleans, Annapolis' second annual Mardi Gras fête holds its own with 12 days of music, food and parties hoped to lure in revelers from throughout the Mid-Atlantic. Bigger and better than last year, the celebration now includes a parade down Clay Street and a lot more gumbo. Partying kicks off February 16 - that's MoJo Day - when Annapolis Visitors Center passes out free Mardi Gras beads to all comers. By then, 60 to 70 original Mardi Gras masks, many designed by local art students, will jazz up storefronts at Annapolis Harbour Center, to stay up until the crescendo of Fat Tuesday on February 27. Fans of Creole cuisine will get their chance to set palates ablaze at the Chefs' Signature Gumbo Cook-off on February 18. 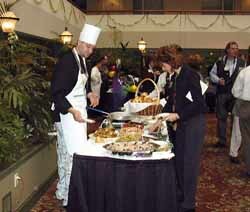 Competition is sure to be stiff with 30 area chefs competing - six more than last year. Last year's winner, sous chef Zolton Kimble from Café Orleans, says the most important ingredient for succulent gumbo is a bayou chef's instinct. "You've just got to have that New Orleans flair. You've got to know New Orleans," explains Kimble, 31, born and raised in the Crescent City. "You know, you're puttin' your love in that pot. You're cookin' your soul!" Though he grew up eating mom's savory gumbo, the winning recipe is his own creation. For a small cover charge, you'll get to taste his and everyone else's best bayou potpourri (3-6pm @ Loews Annapolis Hotel; $5). If your tongue pains from Cajun spices, numb it at the Hurricane Mix-off and Best Mardi Gras Mask Contest, set for February 20 at Chart House Restaurant (5:30-8:30pm). Later in the week, give your palate a break while celebrating Chesapeake Country's answer to crawfish at the Oyster Shucking Contests, two days of shell-splitting prestidigitation at Copeland's (5:30-7:30pm February 20) and Phillips (2-4pm February 25). As Fat Tuesday nears, clowns, jugglers and magicians turn out in the streets at the Clay Street neighborhood's Mardi Gras Parade and Party on February 24, sponsored by We Care and Friends. A parade kicks things off, followed by a party at the Stanton Center featuring live music by Mama Jama, Imagedry, James Mabry and a surprise Cajun band. Come costumed in your best Mardi Gras getup and you may win a door prize (parade 4pm, party 6-11pm; $20 w/discounts: 410/269-1595). For a more exclusive affair, the Cultural Arts Foundation of Anne Arundel County hosts the Mardi Gras Gala on February 24 - your choice of a costumed or black tie optional soirée. Dinner and dancing includes live music by the Crabtowne Big Band (7pm @ Sheraton Barceló; $, rsvp to 410/222-7949). Mardi Gras partying climaxes February 27 in a smattering of parties at local bars, restaurants and hotels. Whilst you feast and frolic, be careful which slice of king cake you choose. Tradition holds that whoever gets the piece bearing a little plastic baby will have good luck for the coming year - but also gets to host the next Mardi Gras party. Find the baby in the wrong cake, and you might be getting a call from the Annapolis and Anne Arundel County Conference and Visitors Bureau next year. To get a complete list of events and party spots, the Annapolis Visitors Center has Mardi Gras brochures: 410/280-0445. You can also find the updated schedule at www.MardiGrasAnnapolisAAMD.org. I walk the streets of Annapolis with too meager a sense of its history. The village is sealed with mortar and sweat of many generations, smoothed in the cracks of the sidewalks and brick buildings that stand tall and quiet. If only those bricks could talk. Now, with the help of the Historic Annapolis Foundation, a set of headphones and about two hours, I have deepened my sense of how this city was ripened by African Americans. I am plugged into the Historic Annapolis African-American Heritage Audio Walking Tour. How odd it is to walk the familiar streets, my head full of landmarks of African American history in the capital of Maryland since 1695. Like a tourist, my head swivels slowly and my eyes dart like an automatic camera lens trying to focus. I'm in a time machine of words. Narrator Charles Duman's rich, crisp voice leads me to the hub of downtown activity, City Dock. The African American heritage of City Dock is more visible now with the Alex Haley-Kunta Kinte Memorial, set in December of 1999, confidently restoring the past, witnessing the present and inspiring the future. Slave ships docked at City Dock in the 1700s where now a large catamaran gently rests in the still water. Where Kunta Kinte first stepped ashore in 1767, his descendant, Haley, now sits as a timeless reminder that African Americans anchored this city, representing 42 percent of the city's population in the early 1800s and a third consistently to our day. Like the Dr. Aris T. Allen statue (located at the intersection of Aris Allen Boulevard., Forest Drive and Chinquapin Round Road) and the Thurgood Marshall Memorial (which stands outside the State House), the Kunta Kinte-Haley Memorial stands in the center of the community, a lasting reminder of the rich diversity of this capital town. Within one mile of my own downtown home, 15 sites and stops are laced together with legends of African Americans who helped break the chains of slavery and segregation. St. Anne's Cemetery, nestled in a corner of Northwest Street, was the only public burial ground until the mid-19th century, so both black and white Annapolitans were buried there. What an irony of fate: In a time where blacks had to buy their families out of slavery, both races ended up sharing the very same earthly space. At 163 Duke of Gloucester Street is the home purchased by free black John Maynard in 1847. Maynard succeeded also in buying his wife, her daughter and his mother-in-law out of slavery. After Maynard's death in 1874, Willis Burgess purchased the house in 1914, and his family owned it until 1990. A $212,500 facelift will begin in April, preparing the house as a museum depicting 19th century African American life in Annapolis. As I walk against traffic approaching City Hall, I realize just how often I pass the Maynard-Burgess house without a second thought. I delivered Bay Weekly to City Hall every Thursday for months, swiftly parking almost in front of the historical house to cross the street. On East Street, in 1868 was built the Galilean Fisherman Free School, the first successful Anne Arundel County school for African-American children. The school's growth was marked with a difference in brick that I had never noticed before because I had never looked up at the four-story building. The same goes for the Naval Academy. The Naval Academy opened in 1845 and is home to more than 4,000 midshipmen. Yet the first three African Americans to attend the Naval Academy, starting in 1872, were driven out. Stories of how two races learned to live together are everywhere - and everywhere nearly forgotten. · "African-American Heritage in Annapolis and Anne Arundel County." In this sturdy brochure, Annapolis & Anne Arundel County Conference & Visitors Bureau describes plaques and memorials, museums, houses, churches, schools and neighborhoods of African American origin and importance. Get your free copy at 26 West Street: 410/280-0445 · www.goannapolis.org. · African American Heritage Audio Walking Tour rents for $5 at Historic Annapolis Foundation Museum Store, 77 Main Street: 410/267-7619 · www.annapolis.org. · Naval Academy African American Heritage tour. rsvp $4.50 at Armel-Leftwich Visitor Center, US Naval Academy: 410/263-6933 · www.navyonline.com. Have you noticed a little more daylight gracing your evening? That's one of the first signs spring is chompin' at the bit in Bay Country. Longer days are only one sign spring is near. We're surrounded by many more, some quite amazing. After only a few balmy hours, resident bluebirds swoop and circle their houses. Hoards of newly arrived grackles streak from treetop to treetop. Red maple buds burst their seams. Shoots of crocus and daffodil peak through the ground. Even bald eagles are screeching and circling, reinforcing their nests. Can spring be far away? For nearly 30 years, Bay Country painter and author John W. 'Bud' Taylor has plodded through the marshes, beaches and creeks around his Mayo home and along the Bay, studying its unique blend of water, land, marsh and wild creatures. Taylor maintains there are only two seasons in Chesapeake Country: Spring, when the light ascends, and fall, when it descends. Spring though it may be, Taylor says he's heard more than he's seen of spring's arrival. "I've not seen many signs yet, only a few new birds and a goldfinch getting its bright yellow spring feathers," says Taylor. "But the red-wings, grackle and robins are singing, and that's a sure sign." It's not just warm hours that bring on the birds, Taylor advises. "There's too much emphasis put on the weather. Birds migrate to an instinctive time schedule rather than the weather." There's no place where that's more evident than Nanjemoy heron rookery in Charles County, where spring comes by instinct. There, February 14 is more than Valentine Day. It's also the day the herons sail in like pterodactyls on the return to their nests. This 288-acre Nature Conservancy preserve, where 25 percent of Maryland's blue herons are fledged, literally comes alive. Herons have been living in this remote wood since the '40s, arriving on cue from the southwest. They come back so regularly that locals now call them love birds. Will the love birds be arriving on time this year? "Everything seems to be on schedule," says Anand Mishra of the Conservancy. "We expect about 2,000 herons to arrive the 14th." The Conservancy estimates the count by the number of nests. The Nanjemoy rookery is down to 1,000. "We've lost about 200 nests," says Mishra, "but there's no indication there's cause for alarm. There are over 40 other rookeries in Maryland and over 150 in Virginia the birds could have moved to." As sure as herons will return to Nanjemoy February 14, robins will sing, eagles will soar and Mother Earth will give forth new life, spring is returning to Bay Country. The only question is when will the weather warm up. Southern Marylands new Project Linus coordinator Jill Malcolm and daughter Tori, right, with blankets for baby Diamond at Baltimores Mt. Washington Hospital. Fluffy, fuzzy, booby, blanky. Whatever kids choose to call their blankets, the two go together like cake and ice cream, beans and cornbread, peanut butter and jelly. Even Charlie Brown's friend Linus has one. So do 265,000 children around the world thanks to Karen Loucks. 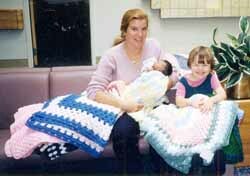 Loucks founded Project Linus in 1995 after reading the story of a little girl's intensive chemotherapy and her special blanket. Since then children from Denver to Dallas, St. Louis to Baltimore, Québec to London, have received blankets from the volunteer organization whose mission is to provide love, a sense of security, warmth and comfort to seriously ill and traumatized children and teens. Filling that big bill are blankets handmade by volunteers called blanketeers. Some 1,400 of those special blankets are comforting kids around Baltimore. Kids at John Hopkins, the University of Maryland and Mount Washington hospitals suffering from cancer and other life-threatening diseases. Kids facing frightening surgery. Traumatized and abandoned kids in halfway houses and shelters. "I know the power these blankets have," says Project Linus Baltimore coordinator Jill Malcolm, who roomed with Loucks in college. "I've seen a sick baby covered and fall into peaceful sleep, grateful parents in tears because a stranger cared enough to make a blanket. Somehow these blankets create a loving link toward helping a child feel security during a difficult time." Fifty of the Baltimore blankets were stitched by North Beach blanketeer Gail Hollis. A seamstress since her teens, Hollis has two reasons for volunteering. "When you do lots of sewing, you generate piles of fabric scraps," says Hollis, who heard of Project Linus on the Rosie O'Donnell Show. "And my son's night-night-kitty blanket is still special after 10 years." Now Malcolm is following Hollis to Southern Maryland, where she's adding a new chapter to the 350 across the United States with affiliates in Canada and England. Covered, figuratively speaking, are Calvert and lower Anne Arundel counties plus Charles and St. Mary's counties. To make that coverage literal, she needs help. Not just masterful help. As well as seamstresses, Girl Scout Troops, shut-ins, seniors - even a Boy Scout seeking his Eagle badge - have all contributed blankets. The blankets don't have to be elaborate. All styles - including quilts, tied comforters, crocheted or knitted afghans, even receiving blankets - are needed. The most popular blanket among teens are bright-colored fleece ones. "Buy one piece of material; add a simple edge and you're a blanketeer," says Malcolm. The Southern Maryland chapter will operate from Malcolm's Huntingtown home until she finds a church to host a central collection and distribution point. Will Southern Maryland wrap its arms around Project Linus? If the first few days are any indication, yes indeed. Malcolm received 20 blankets after only two days from a community listing. Hollis just delivered 12 more. Information? Jill Malcolm at 410/535-9583 · [email protected]. Our Creature Feature, from Norway, is so odd we've given it a title: "The Blind Cod of Oslo." A fisherman named Harald Hauso caught a blind cod in his net last week for the 40th time since last March. Each day, Hauso would fling the scrawny, sightless six-pound fish back into the Hardanger fjord. But soon he would find it in his net again. No more. The cod was dispatched last week to a marine park, where he'll live out his fishy life in a fine aquarium. And he won't be alone: He's sharing his new quarters with a near-sighted halibut named Big Mama.